32 to 64bit VST host. Bitsonic applications run on 32 bit and 64bit music maker/composer programs, but maybe you need a solution to run a 32bit VST on your 64bit DAW. jBridge is a great solution for them to run on 64 bit systems without any issue. All you have to do is to download the Jbridge application, and install it in 3 minutes. 3, Find the jBridger.exe application in the Program Files/jBridge folder. 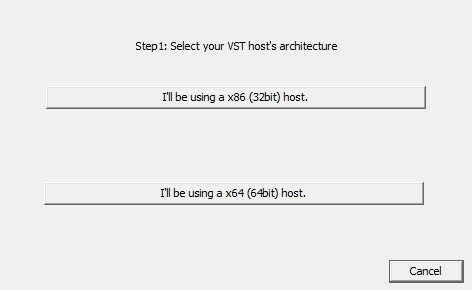 5, Select „I’ll be using x64 (64bit) host. A new window should appear. 6. 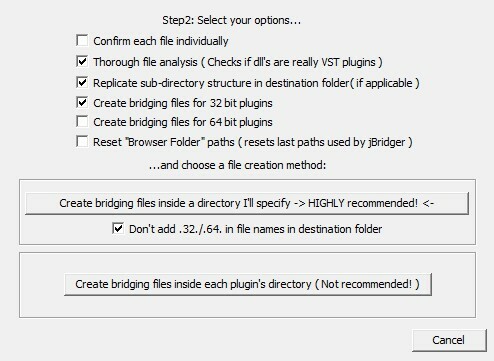 Select the „Thorough file analysis”, „Replace sub-directory structure” and „Create bridging files for 32 bit plugins” options. 8. The program will ask you the destination folder for 32 bit softwares. Find, and select the folder. 9. Appoint a 64 bit folder as well. 10. The system will find the 32 bit VST plugins. When finished a window will appear. 12, Now all that’s left is for you to run DAW as administrator. From that point on, you will be able to use any 32bit applications on 64 bit DAW as well.